New York Rangers President and General Manager Glen Sather announced today that the club has named Alain Vigneault as the team’s new Head Coach. 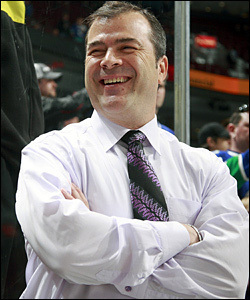 Alain Vigneault spent the past seven seasons with Vancouver, taking the Canucks to the 2011 Stanley Cup Final and winning two Presidents' Trophies as the regular-season champion. Vigneault, 52, becomes the 35th Head Coach in the 87-year history of the Rangers. He joins the organization after serving as Head Coach of the Vancouver Canucks for seven seasons. Under his guidance, Vancouver compiled a 313-170-57 record for a .632 winning percentage in 540 games. He led the Canucks to back-to-back Presidents’ Trophies in 2010-11 and 2011-12, and captured the Northwest Division title in six of his seven seasons in Vancouver.